Presented by Zoetis, the Veterinarians on Call YouTube channel features real-life vets doing a variety of tasks. This week, Dr. Deanna Fuller from New York's Countryside Vet Clinic volunteers her time to care for abandoned cats. Follow this link to watch the video. On Monday, Sept. 3, the current FFA.org will be decommissioned, and the newly revised FFA.org will be your place to get FFA-related content and resources. Our vision with the new website is to provide a modern digital experience, more content geared toward telling the FFA story, and a website that works better for all of our stakeholders. The first two weeks of our soft launch have gone well, and we have received a lot of feedback, all positive and constructive. If you have not had a chance to visit the new FFA.org, check it out now. National FFA will need several hundred volunteers during the 91st National FFA Convention & Expo, Oct. 24-27, in Indianapolis. If you, or anyone you know, has an interest in serving as a judge, click here to learn more and apply. The Educational Development and Evaluation Team at National FFA is seeking collegiate and teacher (who are not bringing students) volunteers to assist with various expo booths and teacher workshops during the 91st National FFA Convention & Expo. Volunteers will help with setup, facilitation/discussion with students and teardown. Each volunteer will be assigned to one of the following areas: FFA educational resources booth, We Are FFA booth, AgExplorer booth or teacher workshops. Click here to access the application and to find out more information on the responsibilities and duties of a volunteer. The deadline to apply is midnight EDT on Sept. 1, 2018. Want to engage your students in hands-on learning, while meeting a community need? The 2018 Fall Semester-Long Living to Serve grant is due soon. Apply for up to $1,200 to support a semester-long service-learning project that addresses a community need in one of four focus areas: Community Safety; Hunger, Health and Nutrition; Environmental Responsibility and Community Engagement. Need ideas for semester-long service-learning projects? Check out the interactive map at www.ffa.org/livingtoserveto review projects funded last school year. Additional information on the grant can also be found on the website. Applications are due September 1, 2018. Email questions to LTS@FFA.org. Hosting a service event around the holidays? Now is the time to apply for a Day of Service Mini-Grant! Applications are reviewed on a rolling basis on the first of each month. To learn more about the Day of Service Mini-Grant, visit the Living to Serve Grants website at www.ffa.org/livingtoserve/grants. Two big deadlines are quickly approaching for alumni and supporters! The last round of grants for Give Back to Your Roots and Legacy Grants for 2018 and the applications to apply to be on the National FFA Alumni and Supporters Advisory Committee are all due on September 4. Whether you’re just starting a chapter or ready to get involved even more, both opportunities are great! Questions about either item? Email alumni@ffa.org at any time! 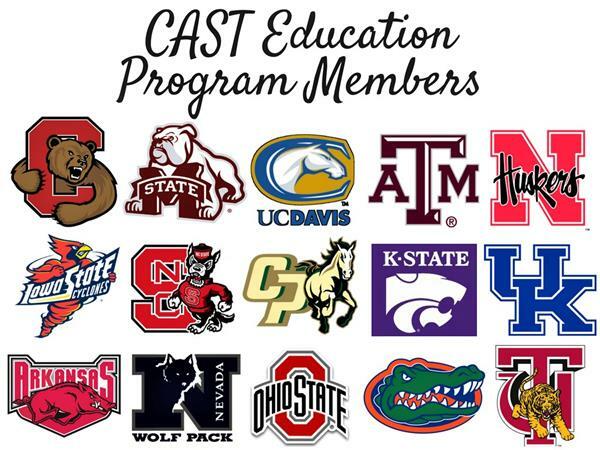 The CAST Education Program includes the NAAE and many top-ranked universities. Friday, August 24, 2018: A new school year and a growing CAST education program; lab meat might be on the menu soon; and a whale makes a big splash for tourists. These and many more ag/science stories in this week’s edition.